If to you’re from 20 to 30, you of course remember them very lively. But if you are a girl, teenage recollections your are very tightly connected with them, with first love, walls in posters and total hysteria. Tokio Hotel still have magic authority above an audience. Even if you once forgot about them, they made it necessary to recall. Before the concert in Ekaterinburg, We sat down with German kings of hearts to talk about getting old, reading fan-fiction, bucket lists and how it is easier for boys out there..
— Actually, I thought you two (the twins) are taller. Tom: We’re 27, it’s not a joke! — Anyway, I decided to ask just anything I want. That all made me think: have you ever Googled yourself? Bill: Yeah. I mean I try not to. Nowadays I don’t really do it anymore, but yeah… If something, that you hate, coming out, or if there’s a new album, you do that and you look, what people say and what people think, you read reviews. I mean, yeah, you do it every once in a while. If it gets too negative or there’s some stupid tabloid thing out there, I try not to read it, I want to stay away from it. Some really stupid stuff came up recently, that people were telling us about, so we tried not to read any articles. Because we don’t want to get distracted by that. — Does it make you sad? Tokio Hotel: What did the band say to the Poles? The Tokio Hotel team once again visited Poland and by the way, they had a moment to talk to us. On ESKA.pl we have an interview with you guys and a special message for fans from our country. German band Tokio Hotel on April 12, 2017 played an impressive show at the Warsaw club Progresja. On the occasion of this visit, Bill, Tom, Gustav and Georg took a moment to sit down with us and answer a few questions about, among others. their latest album “Dream Machine”, life on the road, show business, and … fall into the scene. 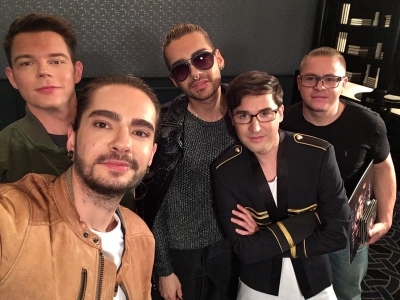 Robert Choiński, the editor of ESKA.pl, spoke with the boys from Tokio Hotel. Be vigilant, because soon there will also be additional material on which the members of Tokio Hotel played with us in the game YES / NO! Robert Choiński: I would like to talk a bit about your latest album. The album “Dream Machine” is the most electronic material you have ever recorded. Why did you decide to go in this direction? Tom Kaulitz: Electronics is a very comprehensive concept. I guess it’s hard to say what we call our music. In our case, it involves primarily programming a lot of things. In general, I do not think this record was more electronic than the previous one. Our sound is constantly changing, but since the album Kings of Suburbia we have found our way. This has started. This time we just did everything by ourselves – we took care of production and mix. This is a very personal album that is very important to us. There are only 10 carefully selected songs. It’s 100% Tokio Hotel. We found our sound and that means a lot to us. Of course, we also experiment with synthesizers, with sound. We use the novelties that appear, but also the live instruments and we combine it all in the studio. But yes, this is electronics, if you want to call it something. Robert Choiński: I have a question for you Gustav. Without resentment for the rest of you, but that’s what I see you as a real rock-man in this band. How do you feel about how Tokio Hotel is changing? You as a fan like Johnny Cash, how do you feel that the sound of Tokio Hotel is becoming more and more pop?